Your review was posted to Empire Today, LLC. We do not sell or care for drapes, so we feel this may not be intended for us. If your review above is associated with our company please email your contact information to customersupport@empiretoday.com so we may assist you in this manner. Please place "pissedconsumer.com drapes" in the subject field. They were not returned. I have made comlaints to the courts, NY Attorney General, govenor and I have not given up. I paid dearly for drapes. 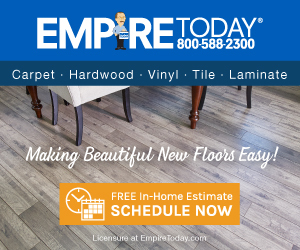 I would not recomend Empire Carpet & Flooring, read the complaints. Review #911763 is a subjective opinion of User911763. Hello. Your review was posted to Empire Today, LLC. We do not sell or care for drapes, so we feel this may not be intended for us. If your review above is associated with our company please email your contact information to customersupport@empiretoday.com so we may assist you in this manner. Please place "pissedconsumer.com drapes" in the subject field.